Getting the push in North America, thanks to public relation's advocate Rainmaker Media Group, is Swedish singer/songwriter Kristina Westin and her second album In the Back of My Mind. Westin's reputation precedes her in her home country where she is known for her work with pop rock outfit The Valets. Earlier in life she was exposed to jazz from her mother and grandfather, a jazz drummer. In the late Nineties, she pursued the avenue of country music. Pop rock, jazz, country? So what's the direction of In the Back of My Mind? It's basic melodic rock with appropriate seasoning from Westin's historical influences. While I don't profess to be a follower of all things alternative and melodic rock, especially those from a female vocalist, Westin's In the Back of My Mind is certainly a noteworthy work. Immediately, the listener will notice one indisputable fact: Ms. Westin has a beautiful voice. She's passionate, versatile, and strong. The PR material mentions that she's been described as mix between Norah Jones and Dolly Parton. As horrifying as that may sound, especially the Parton side, I don't hear it. Simply, Westin is delightful: smooth and entertaining. The second fine attribute of In the Back of My Mind is the songs. Kristina Westin is a superb songwriter. Composing upon piano and guitar, Westin draws from life, love, and intimate observation to create well-balanced enthusiastic songs. Best cuts include What a Night, Stay Another Year, Where Do I Go, and Pretty Girls. While the overall motif is melodic rock, you will still find the jazz and country influences that shaped Westin's musical life. Kristina Westin's In the Back of My Mind is a fine work of melodic rock. Between her beautiful voice and exceptional songwriting skills, Westin delivers an entertaining gem. Very recommended. 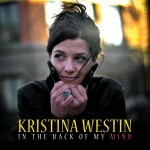 Kristina Westin's In the Back of My Mind is a fine work of melodic rock. Between her beautiful voice and exceptional songwriting skills, Westin delivers an entertaining gem.